Use this helpful guide to get practical tips for staying comfortable while sleeping in your car during road trips or while camping. Sleeping in your car doesn’t have to mean waking up on a road trip, with a kink in your neck and drool on the door panel. There are times that sleeping in your car can be the easiest and most logical solution- not only just for camping, but for traveling. 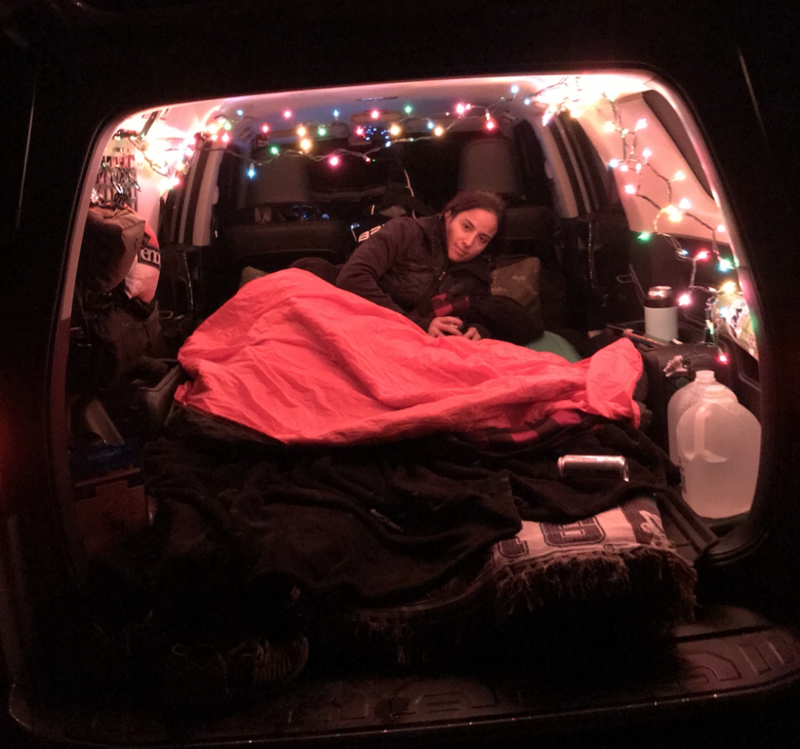 Sleeping in your car is not only economical but helps reduce the amount of time you’ll be setting up and packing up at your campsite, which is why I opt to do it on most of my weekend warrior getaways. If you plan ahead and follow some of these tips for sleeping in your car, you should have a restful and enjoyable experience. 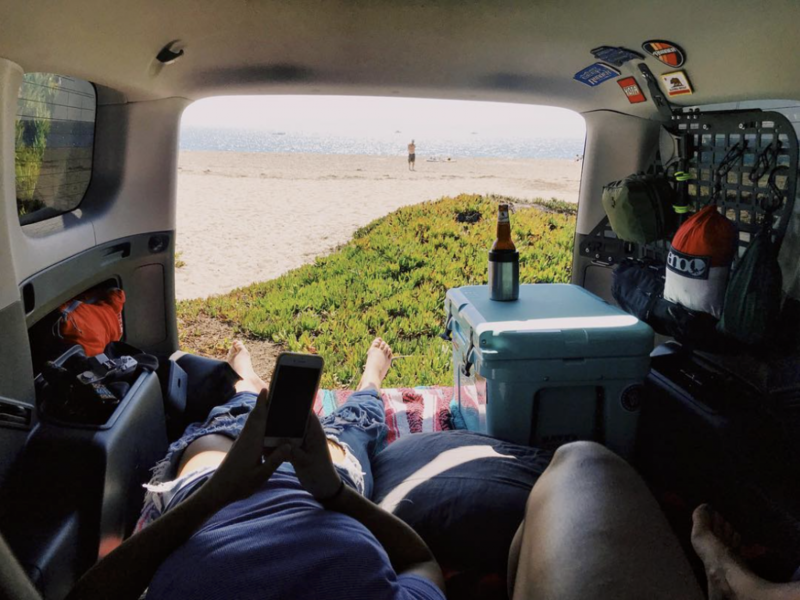 Before you venture out on your first car camping trip, measure the area you’ll be sleeping in to make sure you’re able to comfortably fit in your vehicle. 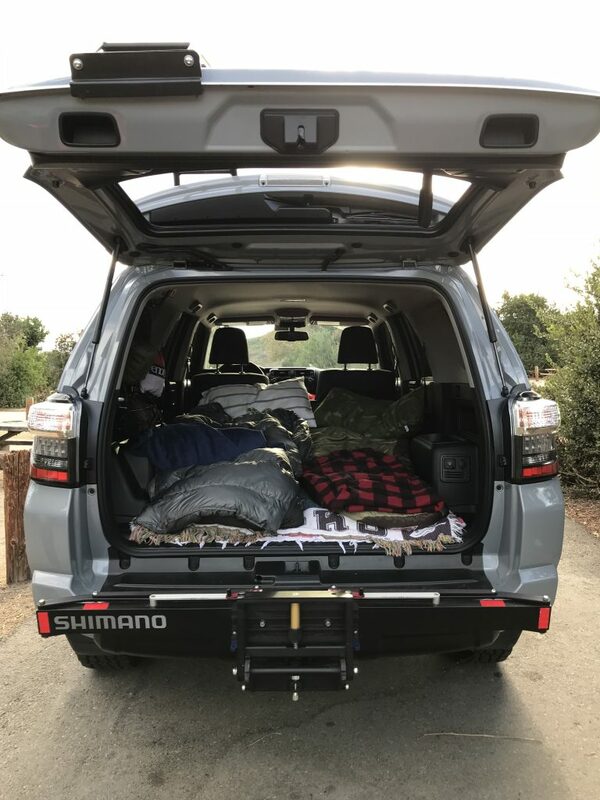 One of the reasons I chose my Toyota 4Runner was for the ability to go on quick weekend camping trips and sleep comfortably inside the car. I’m 5’6″ and with the rear seats folded down, I fit perfectly laying down in the space between the seat to trunk door. This makes it easy for me to comfortably fit two people my size or under for sleeping, if necessary. Depending on your car or height, you may want to sleep sideways from corner to corner to buy some more space. Also, don’t forget to consider that you may have to keep some gear inside the car with out overnight. You won’t always be lucky enough to find a flat parking spot so always be sure to keep your head at the high point of the vehicle with your legs on the lower end. The deck of the trunk isn’t the softest sleeping surface, so trying to catch some shut-eye with only a sleeping bag between you and the deck may result in a rather uncomfortable night. While not completely necessary, I knew I’d be sleeping in my car on more than a few occasions, so I chose to spruce up my space with the purchase of a sleeping pad. I measured the space in my trunk and found the best choice for my needs to be the Thermarest Women’s PROLITE Plus. The PROLITE Plus measures 66” inches in length and fits perfect in my trunk (trunk space measured at 70”). The PROLITE Plus is a 1.5” thick, self-inflating pad, weighing just 1lb 6oz. I chose to go with this more versatile option, rather than a thicker and heavier option, allowing me to use it for future backpacking or camping trips. When I’m not using the pad, it stores perfectly under my mattress frame, as Thermarest recommends you store the pad inflated and flat. You might consider other options for your needs, depending on trunk space and your size. Other options include Therm-a-rest ProLite Plus or the Klymit Insulated Sleeping Pad. There are also plusher and more comfortable options available. If you’re looking for a sleeping pad purely for sleeping in your car, and if car space and storage is not an issue, check out options like MondoKing 3D or DreamTime from Therm-a-rest. Another nice option is having a good pillow. Of course you can just ball up your sweatshirt but having a good pillow really makes a difference. You can either bring a normal size pillow (or two) or take a compressible pillow for easy storage. Depending on where you are and what the season is like, temperatures can drop pretty low inside your car at night. You’re going to want a warm sleeping bag to prevent heat loss throughout the night. Usually, I’ll lay my extra blanket that I keep in my car over my sleeping pad for a little extra cushion and comfort. Depending on the temperatures and space, you can bring a second blanket for added warmth. You won’t want to have your car running to rely on power. I always bring a portable battery pack, like the Mophie Powerbank XL, because it allows me to charge multiple devices for at least a couple of nights. I can charge my iPhone or iPad and still have plenty of power left over for the next night. Another good option is the Anker Powerbank which has two USB charging ports and can charge an iPhone up to seven times. Using the Luminoodle to light up the car. Make sure to have a light source available in case you need it. 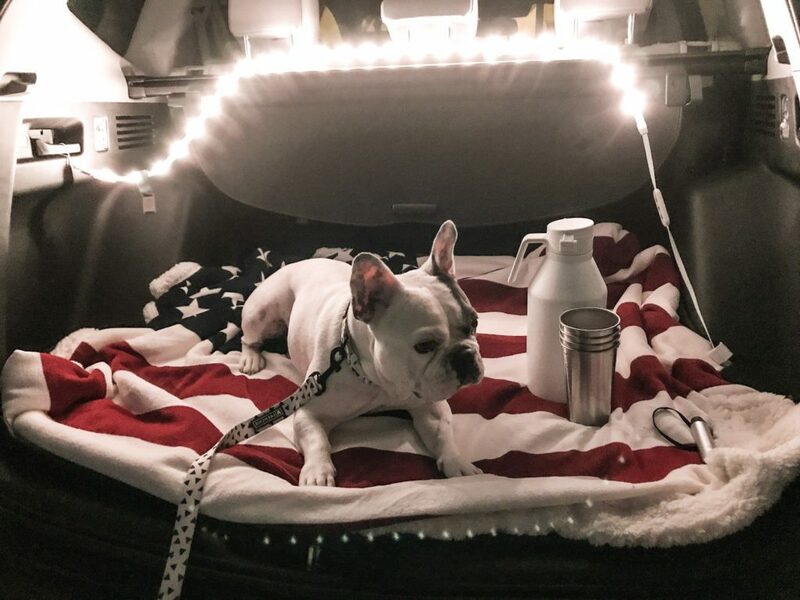 I’ve used all kinds of things as lights such as clip-on bicycle lights, camping headlights attached to the interior ceiling handles or the Luminoodle, a light rope that can be used as LED string lights or put in the bag to make a lantern. You can read a full review of the Luminoodle here. I also like to keep a mini LED flashlight in the door pocket of the side I’m sleeping on so it’s easily accessible in case I need to get out during the night for a restroom break. Grab a camping headlight, Luminoodle or mini LED flashlight. Now that you’ve gotten your sleeping situation dialed in, you’re ready for a night of restful sleep before your big adventures. Sweet Dreams!